Here follows a list of every Brotherhood Base Structure featured in Command & Conquer 3 : Tiberium Wars. A Deployed Emissary allows you to build structured near it, making it ideal for fast area grabbing without having to drive there with the MCV. Available after building a powerplant, this defensive structure is especially effective against infantry. It consists of a central hub, powering 3 distinct turrets that can be placed in the direct vicinity of the hub. Available after building a Hand of Nod, this defensive structure is especially effective against light units. It consists of a central hub, powering 3 distinct turrets that can be placed in the direct vicinity of the hub. Available after building a powerplant, this defensive structure is your primary anti-air defense. It consists of a central hub, powering 3 distinct turrets that can be placed in the direct vicinity of the hub. The name pretty much says it all. Keep your power at healthy levels, or suffer limited production speeds. This building can be upgraded so it provides even more power. This produces all of Nod's ground vehicles. The expectation is that units will be built underground, then when a unit is ready, it comes to the survace on a big platform. This structure gives acces to Venom fighters and Vertigo bombers. It supports 4 aircraft. The Armory gives access to airforce technology, the tech centre, sam sites, and also grants several special abilities. This flower-like structure provides a safe haven for Nod's Infantry forces. It heals them and allows more specialized soldiers to be trained. This is Nod's Tech center, giving access to more advanced units and structures such as the Avatar warmech and the Obelisk of Light. 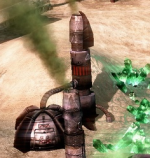 Provides access to several tiberium related units upgrades, as well, as the Catalyst Missile and the Seed Tiberium ability. This buidling cloaks all surrounding Nod forces and buildings.